Both teams went undefeated this weekend with a combined record of 18-0, defeating teams with a combined margin of victory 450 to 253. New Haven entered Pacific 7-0, not having lost a set this year. They began pool play on Saturday taking on St. James in their first match, knocking them down in both sets. (25-14, 25-9). The Rocks handled Salem, mowing them down, 25-9, 25-14. In their third game the Rocks faced a very good Owensville squad. New Haven won the first set 25-16, however Owensville became the first team this season to score over 20 points against New Haven. New Haven outlasted the Lady Dutchmen and winning their pool, 25-21. The Semifinal match New Haven took on Union and by far the best team they have played. Again New Haven displayed their ability to beat good teams and compete in close games. The Lady Shamrocks never waivered, knocking off Union in two hard fought sets, 25-20, 25-22. The tournament host team Pacific had hoped to keep New Haven from winning the tournament two years in a row. Hoped was all Pacific could do, hoping just to score a point in the first set as New Haven ran over the Indians 25-6. Pacific’s hoping to win faded into a dream, as the Lady Rocks’ perfect record remained intact, winning the Pacific JV Volleyball for the second year, 25-16. Monday night the Lady Rocks will be tested as they take on raveled Borgia at 5:30 p.m. Tune in at 6:30 for our live broadcast right here on QuickNewHavenNews. We will have a special guest helping with the boradcast, Elise McDonald, who was part of last year's team. 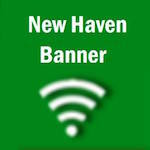 Saturday New Haven played host to the 25th Annual New Haven Round-Robin Tournament. The Lady Rocks went 6-0 in pool play to face take on Winfield who had caused New Haven some troubles during pool play. New Haven jumped out to an early lead in the championship match against the Winfield Warriors, 21-12. An issue the rocks have had all year is closing out games. New Haven went onto win the first set 25-18. Sophomore Taylor Convington currently leads the team in kills with 81. The confidence Winfield began to build in the first set carried over into the second set. New Haven’s one area of consistency has been to not give up and play hard every set. New Haven went onto win their third straight title in their own tournament, outlasting Winfield in the second set, 25-20. They will head into Monday night’s game at Borgia 12 – 3. The one area of concern for New Haven has been the ability to close out games when having big leads. Kayla Meyer had a team high nine assist in Saturday's Championship match.